Ferrari’s Felipe Massa celebrated his 100th Grand Prix with victory after a commanding performance on the streets of Valencia. The Brazilian made up for his late-race disappointment in Hungary by taking Sunday’s European Grand Prix in style – leading from start to finish. However, his victory was only confirmed once race stewards had investigated his second pit stop on lap 37. Massa nearly crashed with Force India’s Adrian Sutil in the pit lane following his stop and the stewards deemed his release had been unsafe. That was one of many incidents for Ferrari at Valencia. Team-mate Kimi Raikkonen had a messy situation in the pits on lap 43, when he was pulled away prematurely while the refuelling hose was still attached to his F2008… In the melee, a race mechanic was struck by the red car’s rear wheel. He was stretchered to the medical centre for further checks. To compound the Finn’s misery, his engine blew shortly afterwards, ensuring he left Valencia empty-handed. The world champion is now 13 points off the championship pace. BMW Sauber’s Robert Kubica continues to impress with another strong podium finish with third. The Pole is still within 15 points off Hamilton in the title race. As for Heikki Kovalainen – who finished in fourth – McLaren may focus its resources by asking Kovalainen to support his team-mate in the remaining races of the season. Heikki has fallen 27 points behind in the drivers’ standings after this event. Toyota’s Jarno Trulli finished in a solid fifth with team-mate Timo Glock again scoring some championship points with seventh. This was an impressive result by the German after running a one-stop strategy to haul himself up from P13 on the grid. In between the pair was Toro Rosso’s Sebastian Vettel. The youngest was the star of the weekend and to finish in sixth is a great achievement. The final championship point went to Williams’ Nico Rosberg, who led home BMW Sauber’s Nick Heidfeld, Toro Rosso’s Sebastien Bourdais and Renault’s Nelson Piquet. Red Bull’s Mark Webber, Honda’s Jenson Button, Renault’s Giancarlo Fisichella, Williams’ Kazuki Nakajima, Honda’s Rubens Barrichello and Red Bull’s David Coulthard all finished the European Grand Prix a lap down. As for the double world champion and home crowd favourite Fernando Alonso, the Spaniard was unlucky to get involved in the opening lap shunt with Nakajima. He had to retire when the Japanese hit the back of his R28, ripping off the rear wing and damaging the suspension. It was a disappointing result for Alonso as the massive ranks of Spanish fans alongside the harbour-side grandstands were left with no hero to cheer on. But it was a good day for race winner Felipe Massa. Despite that pit lane controversy, the Brazilian drove a superb and commanding race from the front. Massa now has the momentum to lead Ferrari to championship success. Can Lewis Hamilton keep hold of his points lead as Formula One travels to the majesty Spa-Francorchamps? We will find out in two weeks’ time. Next race: Belgian Grand Prix, Spa-Francorchamps, September 5-7. Ferrari’s Felipe Massa produced a perfect lap around the challenging new street track in Valencia, edging out championship leader Lewis Hamilton for pole position. The duo battled fiercely in Q3, with the Brazilian initially taking the top spot by half a second after the McLaren driver made a mistake in the final sector of his lap. Undaunted, Hamilton responded with a second attempt that was error-free and went quicker than Massa (by a small margin of two tenths of a second). But Felipe was able to resist and recorded his fourth pole position of the season with a time of one minute, 13.989 seconds. BMW Sauber’s Robert Kubica will start the race in third with the current world champion Kimi Raikkonen alongside for Ferrari. 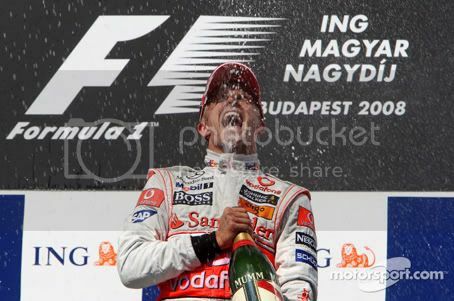 Hungarian Grand Prix winner Heikki Kovalainen could only manage fifth for McLaren. But the real star of qualifying was Sebastian Vettel, who was fastest of all in Q2. The German was driving superbly in the Toro Rosso and to be rewarded with sixth position on the grid is a fantastic achievement for the talented driver. Team-mate Sebastien Bourdais also produce a good result for the team, with his best grid slot in Formula One with tenth. After setting the fastest time in Q1, Toyota’s Jarno Trulli will start the European Grand Prix in seventh, ahead of BMW Sauber’s Nick Heidfeld and Williams’ Nico Rosberg. The former was fortunate to reach Q3 after having to take to the asphalt run-off in the first qualifying session due to a misunderstanding with Timo Glock’s Toyota in traffic. As for home crowd favourite Fernando Alonso, the double world champion was unable to produce a result for Renault after making a mistake at turn 14. Alonso comprised his final Q2 lap when he ran wide over a kerb and thus had to settle with P12. Nelson Piquet, in the sister R28 also had a bad qualifying session and will start the Valencia race down in P15. But the most disappointing driver of all was Jenson Button. The Honda star was showing strong pace during the run-up to the all-important qualifying session but was shocked to be knocked out as early as Q1. Jenson will start the race down in P16 with team-mate Rubens Barrichello even further behind. Even though the drivers have no prior knowledge around this new street circuit, it’s incredible that nobody had any significant incidents during the past two days at Valencia. This might change on Sunday with the possibility of rain and safety car periods. Last weekend, I went to Chelmsford (Essex) to attend the V Festival. I was feeling quite nervous that the wet British weather might spoil the event but in the end, it stayed dry with the sun just breaking out from the clouds. So I made amends by grabbing hold of those elusive V Festival tickets post-haste. I went for the Saturday only ticket but in hindsight, I should’ve gone for the weekend. 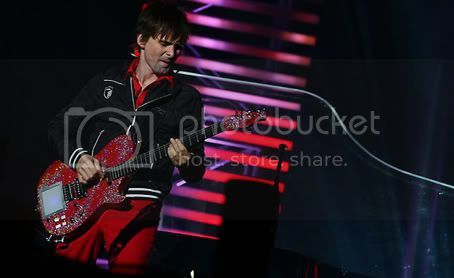 That way, I get to see Muse performing twice! Heikki Kovalainen claimed a surprising victory for McLaren after the dominant Felipe Massa suffered a late engine failure and Lewis Hamilton’s hopes were dashed by a puncture. It was a lucky win for the Finn, as Massa was poised to take the chequered flag after making an excellent start off the grid. The Brazilian jumped both McLarens into the first corner and maintained a small gap over Lewis Hamilton in the first part of the race. Massa was steadily pulling away at the front and appeared to have the Hungarian Grand Prix in the bag following Hamilton’s front-left puncture. But as he powered down the main straight on lap 68, his Ferrari V8 let go spectacularly and Massa grounded to a halt in front of the pits… That late retirement was a cruel blow to the Brazilian as race victory would have placed him in the lead of the drivers’ championship. Instead, it was Kovalainen who took the chequered flag and the Finn becomes the 100th driver to win a Formula One Grand Prix. 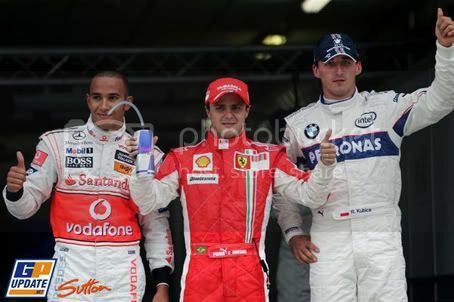 In addition, he is the second driver to take his first win this year after Robert Kubica in the Canadian Grand Prix. Heikki’s maiden victory comes after Vodafone McLaren Mercedes extended his contract to the end of the 2009 season. Finishing in second went to Timo Glock. This was a fantastic result for the Toyota driver as it was only two weeks ago that he was hospitalised following his enormous Hockenheim accident. To take second position was a great achievement, especially as he finished ahead of reigning world champion Kimi Raikkonen. It was another lacklustre race for Raikkonen, as he struggled to find a right balance in the Ferrari. Third place was a good result for the Finn but questions will need to be answered as to why he lacked the speed in qualifying and the race compared to team-mate Felipe Massa. Double world champion Fernando Alonso came home in a solid fourth for Renault, after spending most of the race battling with Raikkonen. His team-mate Nelson Piquet again finished in the points with a fine sixth place. These two points finishes means Renault move into fifth place in the constructors’ standings and are now four points behind Toyota. Finishing in between the Renaults was Lewis Hamilton. The pre-race favourite was on course in achieving his hat trick of race victories with a front row start, but as the five red lights went out, he was out-accelerated by Massa into the first corner. The McLaren driver did his best to maintain within touching distance with the Ferrari during the first rounds of pit-stops but on lap 37, he suffered a front-left puncture. Lewis was able to return back to the pits and he did well to recover from this incident. Finishing in fifth wasn’t so bad as those four points will be crucial in the remaining races in this year’s championship. Toyota’s Jarno Trulli finished seventh with BMW Sauber’s Robert Kubica claiming the final point with eighth. 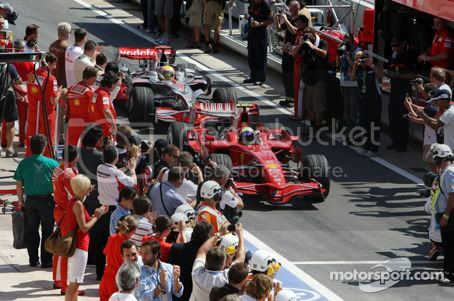 The 2008 Hungarian Grand Prix was also notable for a number of minor fuel fires in the pits. Sebastien Bourdais (Toro Rosso), Kazuki Nakajima (Williams) and Rubens Barrichello (Honda) were all delayed in pit-stops after small amounts of fuel leaked onto their cars as the fuel nozzle was withdrawn. It caused a brief but ultimately harmless fires – for the case of Bourdais, it happened twice! All three were able to continue and finished the race. Formula One now takes a three-week summer break where no testing will be allowed. It will be fascinating how the other teams can develop their cars in the search for performance and reliability without pounding around test tracks. The next Grand Prix will be Valencia, a new street circuit at the home of the America Cup yacht race. Lewis Hamilton will start the Hungarian Grand Prix from pole position for the second year in succession. His time of one minute, 20.899 seconds was comfortably the fastest around the dusty and twisty Hungaroring circuit. By grabbing pole position – his tenth in Formula One – Lewis is on target in achieving a hat-trick of race victories. 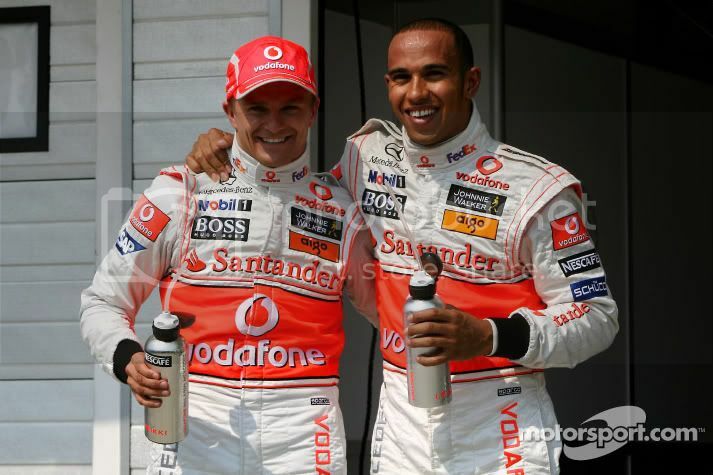 McLaren team-mate Heikki Kovalainen qualified alongside earning the team’s first front row since Monza 2007. The silver cars clearly have the speed advantage over their rivals and it will be fascinating if Ferrari can keep up in the 70-lap race. Championship rival Felipe Massa will start in third while Ferrari team-mate Kimi Raikkonen again struggled with set up issues and could only manage sixth. Robert Kubica heads BMW Sauber’s challenge with a solid fourth while Timo Glock enjoyed his best-ever qualifying to take fifth for Toyota. This was a fine effort from the German following his massive crash in Hockenheim last month. Heidfeld’s first qualifying lap wasn’t quick enough and he needed more to be sure of going through into Q2. Unfortunately, the German felt he was impended by Bourdais in the final corner. The Toro Rosso driver had just lost momentum after letting Giancarlo Fisichella’s Force India by. It was at this moment, the fast charging BMW was approaching… Heidfeld ran wide exiting the final corner and he vent his frustration by gesturing at the Frenchman. Heidfeld complained to the race stewards and after observing the video replays, they found that the Toro Rosso driver was deemed to have impeded the BMW Sauber during the first round of qualifying. And so, Sebastien Bourdais will be moved back five places on the grid for tomorrow’s Hungarian Grand Prix. Rounding out the top ten, double world champion Fernando Alonso will start in seventh ahead of Mark Webber, Jarno Trulli and Renault team-mate Nelson Piquet. Sunday’s Grand Prix might be a procession due to the lack of overtaking opportunities in this twisty and narrow race track. McLaren has the speed advantage over Ferrari, but can the Italian team challenge for the race win? By starting on pole position, Lewis Hamilton has the best opportunity in extending his points lead in the championship standings with race victory. But can Heikki Kovalainen prevent Lewis by claiming his maiden win? What about the tyre situation? Do the super-soft Bridgestone have the durability to survive seventy punishing laps around the Hungaroring? Let’s find out on race day. 4. Kubica BMW Sauber 1:21.281? 8. Webber Red Bull-Renault 1:21.732? 11. Vettel Toro Rosso-Ferrari 1:20.144? 13. Coulthard Red Bull-Renault 1:20.502? 15. Heidfeld BMW Sauber 1:21.045? 18. Fisichella Force India-Ferrari 1:21.670? 19. Bourdais Toro Rosso-Ferrari 1:20.963*?